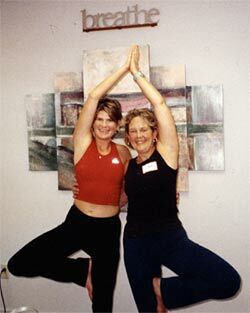 The Yoga Place, unique in the Bennington area, is a space dedicated to yoga and other spiritual practices. We provide a beautiful, light, airy and spacious environment for healing, personal well-being and personal development. Our teachers cultivate safety and warmth in their teaching. Classes are a challenging contemplative blend of asana, pranayama and meditation and are rooted in the richness of yogic tradition as it has been passed down over thousands of years. We are conveniently located in downtown Bennington over Panache. Although our street address is 532 Main St., we suggest that you enter in the back off of Pleasant St. The parking is easier and it is easier to find us! Simply go in the back door and upstairs. The Yoga Place opened in September 2003. It is spacious and peaceful with plenty of northern light. We like to keep it simple and only sell yoga mats, yoga ties, eyebags and water to support your yoga practice. The decor is influenced by our many visits to Asia and occasionally we are able to offer Asian handicrafts for sale. The Yoga Place is fortunate to have many talented and dedicated teachers and we offer many styles of Yoga as well as Pilates. *All classes may be attended on a drop-in basis, so please feel welcome to any class on the schedule. Our teachers will help even the newest beginner feel welcome and supported in their learning. If you have your own sticky mat, please bring it. Otherwise, you can buy or rent one at the studio. We offer changing space but we do not have showers. If it's your first time coming to a yoga class, wear comfortable clothing with no zippers or belt buckles. Eat very lightly or not at all before a class. Expect to feel deeply relaxed and energized by the end of class. Yoga gives us an opportunity to pause and become aware of how things are related. There are no rules for a good yoga practice. The practice of Yoga draws us into a more intimate relationship with our own self. Through this deepened relationship with self, we are better able to enter into union with the higher Self, that community of beings with whom we share life on this planet. We encourage students to take the learning from their moments on the yoga mat in class into the rest of their lives. With Yoga, you learn to focus on what is happening at every moment so that you miss none of your life--on the mat and off. Start now. Let me repeat: Yoga gives us an opportunity to pause and become aware of how things are related. There are no rules for a good yoga practice. The practice of Yoga draws us into a more intimate relationship with our own self. Through this deepened relationship with self, we are better able to enter into union with the higher Self, that community of beings with whom we share life on this planet. We encourage students to take the learning from their moments on the yoga mat in class into the rest of their lives.